After bombarding Angra on 5th July 1581, a Spanish fleet of ten ships, commanded by Don Pedro Valdez, reconnoitred the coast of the island in search of the best landing places, At dawn on the 25th July, the first ships loaded with Spanish troops anchored in Salga bay. A watchman, stationed at the cape called Ponta do Coelho, gave the alarm, but when the first Portuguese forces arrived about one thousand Castilians had already landed and had started to sack the surroundings. In this phase of the fighting a leading role was played by young and pretty Brianda Pereira who, together with other women, attacked the enemy when she saw her house destroyed by them. By nine a. m. the fighting was heavy. 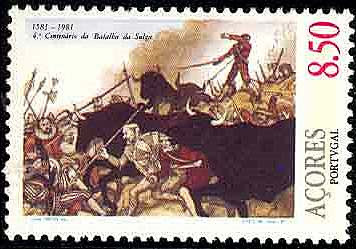 The Spaniards swept the coast with their artillery, which made the task of the defenders more difficult. About mid-day, when the outcome of the battle was still indecisive, an Augustinian named Friar Pedro, who was taking an active part in the struggle, thought of the stratagem of driving wild cattle against the Spaniards so as to scatter them. Over a thousand head of cattle were quickly gathered and, by means of shouts and musket shots, driven against the enemy positions. The terrified Spaniards fell back and were pursued to the shore, where almost all of them lost their lives in the fighting or drowned while trying to reach their boats.